Not just a consultant, we implement our recommendations. Quality and integrity in everything we do. LIMITLESS has saved millions of dollars for clients across the USA. While in the beginning focus was reduction in telecommunications costs, based on large Client demand, utilities such as; water, electric, gas, as well as, waste removal service were added to the services that are now offered by LIMITLESS. LIMITLESS has expanded their portfolio and platform to critically manage all types of vendors billings, contracts, rates, compliance, licenses and mitigate risk. Limitless Technology, LLC (dba Limitless ~ Cost Reduction Specialists) is a U.S. corporation founded in September, 2006 and headquartered in Lake Mary, Florida providing nationwide telecom, utility and waste cost reduction as well as vendor management solutions to medium, large and enterprise businesses exceeding $300,000 in annual spend. LIMITLESS has differentiated itself by creating a strong team of expert auditors and cost reduction and contract negotiation specialists which benefit the customer most by eliminating unnecessary spend and improving bottom line performance. At LIMITLESS, we are not agents or resellers of vendors or supplier services. Instead, we provide the finest vendor management, bill auditing, rate reduction, contract optimization and expense management consulting in the USA. Our experts utilize a powerful cost reduction process, which removes issues related to vendor management, fills gaps in AP processing and Procurement tools, reduces inherent facility affecting risks, and delivers consistently proven results. We are proud of the trust our Client’s place with LIMITLESS…and passionate about reducing risks and increasing our Client’s bottom-line profitability. We are passionate about cost reduction, contract improvement and increasing our Clients profitability. 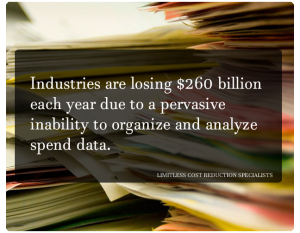 Contact us today at 866-504-4050 or email LIMITLESS at info@limitlesstechnology.com to learn more about our Vendor Management, Billing Optimization and Consulting Solutions. POWERFUL PROCESS – The “power” is revealed through our detailed, organized, accurate, & critical analysis. Our process is strategically engineered & has positively performed across 1000+ businesses. PROVEN RESULTS – Our Clients testimonials, highlight the significance of our results. While this r is small the RESULTS are not~! Countless (or in our case countable) millions have been saved in both hard and soft costs for our Clients. After 20+ years in the telecom business, working for some of the largest providers of telecom products and services in the world, and seeing all sides of telecom technology, operations, finance and contract management, Todd Larsen, CEO of LIMITLESS decided it was time to make a change for the best interest of clients across the US. In his last year’s as an Executive Leader overseeing the management of some of the largest accounts in the world, and seeing the mistreatment of the Client in operations, billing, contracts and customer service, Todd Larsen set out to build a business that would help others have a better insight into their telecom services, contracts, processes terms and conditions and costs. 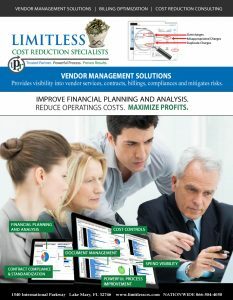 LIMITLESS now provides their expense reduction services across almost any indirect business spend, and is one of the leading providers of fully managed vendor management solutions in the USA. Contact us today at 866-504-4050 or email LIMITLESS at info@limitlesstechnology.com to learn more about how our Vendor Managements Solutions can help you.